Imagine enjoying a hammock between the birch trees overlooking this beautiful, quiet cove... views of the ocean from every room! Western exposure makes for wonderful sunsets. Our little hidden, cocktail deck, tucked under the birch trees near the water's edge is perfect for enjoying the sounds of the ocean as the day winds to a close. Our big yard is great for family soccer games or hanging out on the tire swing. Our cozy cottage has a stone fireplace, breakfast bar and comfortable beds! This home can sleep up to six people. The cottage has three floors - Master suite upstairs(queen) with bathroom with shower - Basement floor has two bedrooms (double in one room and twin with trundle in the other) which open to yard - Middle level has our kitchen, living room, dining area and 2nd bath with tub/shower and washer/dryer. There is an outdoor shower with incredible views! Sliding glass doors from the living room open to a deck that overlooks the yard and ocean. The kitchen has a gas stove, microwave, coffee maker, and toaster oven. There is a full set of pots/pans(including lobster pot!) Dogs are allowed (additional security deposit.) Metal dog crate available (40-50 pound dog size.) No smoking. There are local lobster docks where you can buy your crab or lobster fresh daily- and there are a variety of restaurants within a ten mile radius. The town of Brunswick is 15 minutes away and has a large shopping area. Freeport- with it's many outlet stores and LL Bean - is 30 minutes away. Kayaks can be rented locally and there are many islands to explore or harbor seals to follow if you have water transportation. There are also wonderful walks for humans and / or dogs nearby. The cove is tidal with great swimming at high tide and tide pool exploring at low tide. We recommend bringing water shoes so you can explore among the rocks and shells. We loved, loved, loved your place. It was so serene and lovely. Just what we needed. My friend, Kristin, chose to leave her sheets there due to her bag being filled and also thinking it would be nice for some renters to have them if they needed sheets. We did wonder if most of your renters come by car...the only thing that we would maybe suggest is that you do throw a couple old towels/sheets there for those who are coming by plane. It was TOTALLY 'doable' but did take up a bit of suitcase space. The place was just fantastic. It was a perfect retreat. I hope to return. We enjoyed the stay in your vacation home very much and felt in love with the beautiful sunsets - see the wonderful picture attached. We enjoyed even the rainy days, staying by the fire place reading books. I grew up in Maine and have summered in Harpswell for over 15 years. Love the quietness of Harpswell. There is plenty to do in the area and yet you are off the beaten track. We love to sit with coffee and watch the birds in the morning and then have a cocktail on the little sunset deck in the birches in the evening. Restaurants are near or you can cook your own lobster or grill with great meats from the local butcher. 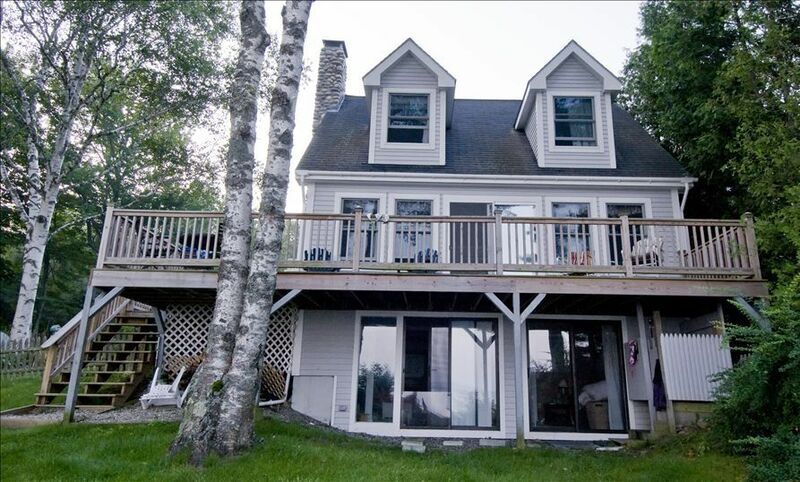 This cottage is right on the water- no obstructed view. There is a set of steps down to the cove from the front yard. Sunset little deck part way down to enjoy a cocktail at the end of the day watching the sunset over the water! Linens are available via a 3rd party service for an additional $40/week. Included if you elect the Linen Service (extra $40/week). OUTDOOR SHOWER! Private sunset deck for two on the water. Large yard for dogs that is fenced in. Larger area for kids to play ball or badminton. Linens can be provided for additional cost. We enjoyed our stay at Sunset Cove and if we ever make it back this way, would definitely stay here again. We would welcome you back anytime! Glad you enjoyed our little spot in paradise. The most relaxing house we stayed out on our trip. It was a really reclusive property that allowed for hours of exploration of the beach, back roads, and lobster shacks. Around the bend was a great convenience store that assisted with our needs, a short drive and Freeport was available to us. Really though, you come here to relax and have quality family time. I would say ~80% of our waking hours at the house were spent on the porch overlooking the gorgeous views of the bay, while the rest of the time was spent on the beach. With the 70 degree fall weather we experienced (LUCKY US!!! ), it was just an unforgettable time. You can tell that this house has seen many memories made by the owners and they want other families to have the opportunity to make similar ones as well. This place was reminiscent of my childhood on a lake cottage... peaceful, expansive, adventurous, and other qualities that are hard to find in today's world. I couldn't recommend a place more for a family to come together and create their own adventures to remember! We can't say enough about this home. The location and the view are incredible. An easy ride to Freeport and Brunswick and every Lobster Shack around. One hour to Portland. The peace and privacy can't be beat. The owners are fabulous and easy to get a hold of and the house is clean and exactly as described. We absolutely love it. Thank you so much for the wonderful review. We're so happy you enjoyed your stay! This was our second year of having a two-week stay at Sunset Cove Cottage and we’ve already booked next year’s stay. The weather was so so this year but it didn’t matter; the entire stay still radiated peace. Rob and Bridget are wonderful, responsive hosts and the cottage has everything you need. We made lots of visits to Erica’s for lobster, discovered Gurnet’s for lobster meat to take home and make our own lobster rolls and fell in love with Pammy’s Ice Cream Parlor. Can’t wait to visit Harpswell again next year! Had a great stay. What a great place to unplug and recharge. So happy to help you find a spot to rest and unplug in this busy, busy world! Thank you for choosing Sunset Cove! Linens can be provided for $25 a week. Refundable Security Deposit increases by $200 (to total $400) if renter brings pets.